Patients deserve the “best of both worlds” when it comes to their healthcare. Ideally healthcare blends the best of both worlds by combining healthcare options from the perspective of both Western and complementary medicine. 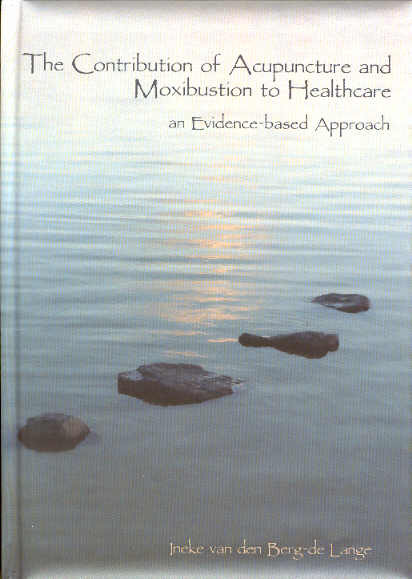 The synergy between modern medicine and complementary health care, and the value of blending these disciplines, has been the focus of this thesis. The aim was to identify the strengths and limitations of acupuncture and moxibustion, as described in Traditional Chinese Medicine, and evaluate how these therapies can be implemented in modern medicine, taking the perspective of patients, physicians, complementary therapists, health insurers, and healthcare policymakers. The thesis consists of three parts. Part one, the general approach, introduces the use of acupuncture in a general practice. The observational study presents the health-related quality of life in patients with musculoskeletal complaints in a general acupuncture practice. The aim of this pragmatic study was to gain insight into whether the HRQoL of patients undergoing routine acupuncture treatment for musculoskeletal complaints differs with that in a Dutch population sample; and to investigate changes in HRQoL during the course of acupuncture treatment. In the second part we discuss also using TCM in the diagnosing of patients with complex regional pain syndrome type 1. The pilot study reports a different TCM-approach to diagnose the patient with CRPS1, by questioning the menstrual cycle conform TCM, which might eventually lead to a new treatment approach. The topic of the third part of the thesis is breech presentation. Described is the development and tracking of nonvertex position (mainly breech position) throughout pregnancy and the prognostic value of ultrasound in predicting nonvertex presentation at delivery in the Generation R study. The aim was to get better information about the natural history of the position of the fetus that leads to breech at delivery. In addition, systematic review and meta-analysis of the existing literature about (randomized) controlled trials on the acupuncture-type interventions on Zhiyin (BL 67) was performed, to elicit a version of a fetus in breech position, including a letter about the same topic. Finally, the results of the modeling approach of a decision analysis and cost analysis of breech version by acumoxa offered to women with a breech fetus at 33 weeks of gestation are reported. In this modeling approach, with sensitivity analysis, also the selective use of a) Moxa, b) the manipulation using external cephalic version, and c) home-births was considered.